you know you are in Corbett, when the tiger’s roar touches your heart’s strings. Jim Corbett National Park – the oldest established national park of Asia, the park where ‘Project Tiger’ was launched; the first park to be declared as a tiger reserve and so forth there is an endless list of milestones that this park has achieved. Why should a wildlife enthusiast visit Corbett? The Corbett National Park is an abode to numerous species of wild animals. Be it a Chital with wide innocent eyes or a Leopard with sharp dazzling eyes; an Elephant with a long trunk or a Langur with a long tail, every member of the wild world can be seen prancing in the park. Thus, be it a prey or a predator, big or small animal, within the beautiful vicinity of Corbett you will find them all. The tigers stand as the main attraction of the park. On one hand where their roar gives goose bumps, on the other hand, it makes an announcement that ‘this is my kingdom’. You can watch the big cats moving around the Corbett tiger reserve with an outstanding carefree attitude in their eyes. Note: Make sure to maintain a distance, as surely you would never want to be the royal meal of the royal cat! The colorful Oriole, the black Drongo, the cute chubby Partridge, the stunning Jungle Fowl; you name the bird and Corbett has it in its arms. In fact, even beautiful water birds like Teal, Dove, Cormorant, Teal and Seagull can also be seen enjoying their stay in the park. Basically, these gorgeous birds are another factor that entices the wildlife lovers to the place. Stretched across 521 square kilometers, the Jim Corbett National Park is divided into four zones for easy administration and hassle free tourism, namely Dhikala, Bijrani, Jhirna and Durga Devi. 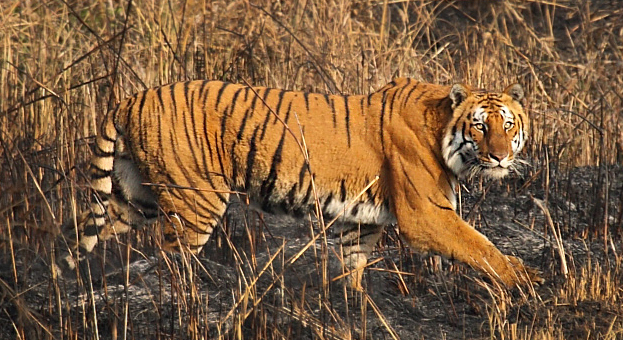 The Dhikala zone is the core area, and thus is the best region for sighting tigers. What is the opening time of Corbett National Park? Though the park remains open throughout the year, the opening times of the zones differ. What is the best time to visit Jim Corbett National Park? 15 November to 15 June is the best time to visit and explore the wilderness of Corbett. It is the ideal time for sighting tigers as the Dhikala zone (the core area) remains open during this period. In fact, you can also get the view of other animals as at the same time the Durga Devi Zone is also accessible. Besides this, you can also visit the park between October to February, March to June and July to September; thus, can explore other prominent areas of the reserve. Where to stay during wildlife holidays in Corbett? All these resorts offer value for money services and warm hospitality; thus, add a charm to the wildlife holidays in Corbett. The Jim Corbett National Park is a paradise with serene green surroundings, in which it cuddles a wonderful world of the wild beings. Thus, it is the perfect destination to spend some time in the lap of the Mother Nature.